A resident makes her way past a burning field after a burn-off to produce nutrients, as farmers prepare for the next crop in the Qigang village in Pudong district, in Shanghai, on November 4, 2009. This article was first published by chinadialogue. At the end of the National Day holiday earlier this month, Beijing bid farewell to weeks of relatively good air quality and experienced another episode of “Airpocalypse.” Levels of PM2.5, tiny pollution particles that are deemed particularly harmful to human health, hit 400 micrograms per cubic meter by the second week of October, more than a dozen times higher than the World Health Organization guideline level (25 micrograms per cubic meter). Official media outlets blamed the latest shroud of smog on crop stalk burning, a practice widely used by Chinese farmers to clear fields after the autumn harvest and which contributes to big rises in air pollution levels in the nearby regions. It's a recurring problem every year, but this time around, central government used its clout to press for a tough response from local government, with largely weak results. In the past few months, China’s Ministry of Environmental Protection (MEP) reported 376 cases of stalk burning all across northern China, a 16 percent increase from the same period last year. Each case is a much bigger problem than burning by an individual farmer—the cases are clusters of fires, or “fire spots” detected by satellites, data which is regularly monitored by the MEP. Henan, Shandong, and Liaoning are among the provinces cited by the central government as failing to deal with the problem. The claimed connection between seasonal agricultural practices and air quality has promoted another debate about how to tackle this perpetual problem of seasonal air pollution related to agricultural practices. Stalk burning poses a particular challenge for China’s environmental authorities due to the dispersed nature of the problem. The task of regulating tens of millions of small farmers is daunting for the authorities, who are hampered by a serious shortage of resources. 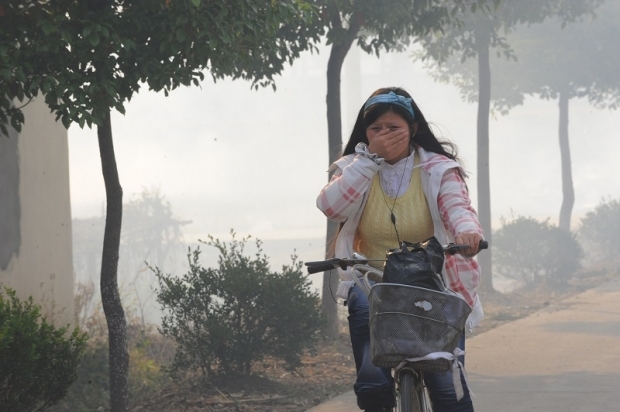 The response to fires over many disparate locations also shows the limitations of the central government’s command-and-control approach, which is more effective when applied to large stationary pollution sources such as power plants. Following the spike in air pollution levels compared with just a few weeks before, the provincial governments rebuked by the MEP initiated massive “no burn” campaigns aimed at stopping farmers from lighting up their fields. In Henan, the provincial government summoned officials from 10 major municipalities and counties to Zhengzhou to highlight their ineffectiveness in dealing with the problem. One of the counties was fined 20 million RMB (U.S.$3.4 million) for breaches, and local officials even deployed the police force to rein in rampant crop burning. In Zhoukou alone, more than 500 people were detained for setting fire to their fields, and even more people received warnings from the police. The campaigns did little to solve the problem, however. In Henan, the provincial authority had to repeatedly summon officials from key counties to make its point, an embarrassing sign of its inability to bring the situation under control. The case prompted media to call for a greater reflection on how the country should address the problem. The stalk-burning problem is a result of fundamental changes in China’s rural economy. On the one hand, shifts in the energy structure of the Chinese countryside have reduced the need for straw as a source of fuel for households. On the other hand, the loss of rural labor to the cities has made manual collection of the remaining stalks uneconomic for women and elders left to take care of the fields. Analysis by Jinzhou’s local government, in Hubei province, shows how the problem is exacerbated by several economic factors. Machinery such as combine harvesters could relieve farmers of manually collecting stalks, but clearing this detritus increases the fuel consumption of these machines (due to the additional cutting and shredding operations), reduces their efficiency, and takes a heavy toll on moving parts. In addition, low straw prices remove incentives for farmers and farm laborers to hire extra hands to do the work. These factors keep the stalk collection rate at just 10 percent in Jinzhou. Given the numerous economic disincentives for farmers to collect or reuse crop stalks, the regulators should offer incentives rather than relying solely on the administrative stick. The government has a range of options, such as supporting downstream industries with the potential to consume large quantities of crop stalks, or to provide direct subsidies for mechanical collection and shredding. But, for this to happen, governmental bodies other than the environment ministry need to be involved, especially those overseeing agricultural, economic, and financial affairs. China’s difficulty dealing with stalk burning has parallels with other environmental battles. Over the years, Chinese regulators have slowly improved their record with at-source polluters, such as large steel mills or coal-fired power plants. However, when it comes to diffuse sources of pollution, be it stalk burning or urban waste generation, the authorities are often less effective at managing the problems. A report by Renmin University, for example, points out that after 14 years of experiments with waste separation in eight major Chinese cities, the practice has been, in the main, unsuccessful. Despite massive advertisement campaigns asking residents to sort their garbage, few cities have managed to persuade their citizens to follow the simple signs on the bins. Recently, high-level Party documents coming out of the politburo call for more market-based measures to address the country’s environmental woes. Whether China can go beyond the clumsy command-and-control approach to keep its wheat and rice fields from being scorched will be a test of the government’s ability to reinvent its environmental policy toolbox.